And I'm Faith Lapidus with People in America in VOA Special English. Today, we tell about Celia Cruz. She was one of the most influential and energetic female singers in the history of Afro-Cuban Music. More than seventy of her albums help document the history of the music known as salsa. That song was "Tu Voz", which means "Your Voice" in Spanish. It was a hit song performed by Celia Cruz and her band, La Sonora Matancera, in nineteen fifty-two. They performed many hit songs. They toured all over the world together spreading the sounds of Cuba. "Tu Voz" is about love and desire. The music helps to transport you to the sunny streets of Havana, Cuba. Like most of the songs of Celia Cruz, this music makes you want to start dancing. Celia Cruz was born in nineteen twenty-five in Havana, Cuba. Her parents were not musicians. But music played an important role in her childhood. Her grandmother once said that Celia could sing before she could talk. Celia would often sing at school and community gatherings. Later, as a teenager Celia started competing in singing contests. She won many competitions. Her father wanted her to be a teacher. But Celia wanted a career in music. She later said that she was both a singer and a teacher. She said that her music taught the world about Cuban culture and the happiness of living life to the fullest. Music is an important part of the cultural life of Cubans. During the nineteen thirties and forties in Havana, Celia heard many kinds of music. Famous music groups and singers would perform live on the radio. She could listen to dance music like the rumba, mambo and guaracha. These kinds of songs were influenced by the music of Africa and Spain. This Cuban music or "son" is defined by the beat of the drum and the call of the singer. It is music made for dancing. In nineteen forty-seven Celia started studying at the Cuban Conservatory of Music. She was discovered a few years later by the music group La Sonora Matancera. This group of was one of Cuba's most famous orchestras. Their lead singer had just left the band, so they needed a new performer. When the group heard Celia's voice, they hired her immediately. At first, listeners missed the band's former singer. But soon, they fell in love with the powerful voice of Celia Cruz. Here is another of her songs recorded with La Sonora Matancera. It is called "Caramelos". Cruz tells about a candy seller singing in the streets about his delicious goods. In the early nineteen sixties, great political changes took place in Cuba. After a revolution, the communist leader Fidel Castro took power in the country. Like many other Cubans, Celia Cruz decided to move to the United States. She later became an American citizen and never again returned to her country. A few years later, she married the trumpet player of her band, Pedro Knight. Soon Cruz and her husband separated from La Sonora Matancera. They had played together for fifteen years. But it was time to explore new musical choices. Celia Cruz lived in New York City where Latin music could be heard in many forms. Many musicians were experimenting with mixing different traditions, rhythms, and styles. The music known as salsa was a combination of Cuban "son" with other Latin sounds. This music expressed the happiness and the pain of life in Latin American communities. Celia Cruz soon became the voice of salsa. She performed and made records with many musicians. She would wear wildly colorful clothing with tall shiny shoes. Her face was often painted with bright makeup. And her dancing was as energetic as her voice. Here is a recording of Cruz singing "Isadora" with Johnny Pacheco and the Fania All Stars. During the nineteen seventies Celia Cruz became famous for calling out "Azúcar!" while singing. This word means "sugar" in Spanish. Cruz would shout out this word to energize her band and her audience. You can hear her saying this word in many recordings. Celia Cruz always enjoyed taking on new projects. She sang many songs with musicians that were not salsa performers. For example, she sang with the hip-hop singer Wyclef Jean on one of his albums. She also sang with musicians such as David Byrne and Patti Labelle. Cruz also appeared in several movies. One of her most well known roles was in the film "The Mambo Kings" in nineteen ninety-two. Not surprisingly, Cruz plays the part of a salsa singer. Here is Cruz performing the song "Guantanamera" from the sound track of this movie. Celia Cruz enjoyed a full and successful life. She won many Grammy Awards. With her seventy albums, she became the most famous voice of salsa music. She was a strong and powerful woman in a music industry made up mostly of men. Celia Cruz also used her fame to help other people. In two thousand two, her husband started the Celia Cruz Foundation. This organization gives money to poor students who want to study music. It also helps cancer patients. In two thousand three, Celia Cruz died as a result of brain cancer. Her life was celebrated at two funerals. Hundreds of thousands of people attended the funerals. Actors, politicians, musicians as well as thousands of fans attended to say goodbye to the Queen of Salsa. We leave you with the song "Rie y Llora" from Celia Cruz's last album. It is a song about laughing and crying. Cruz reminds her listeners to live their lives fully and enjoy every moment. 1. Celia Cruz was born in ______________ . 2. She was famous for the mixture of Latin sounds known as ____________ . 3. In the sixties, Cruz left her country because of _______________ . 4. 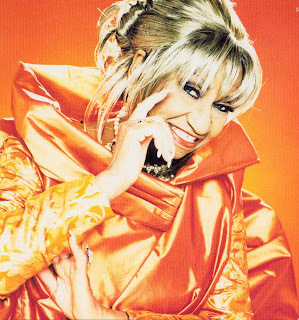 In the song "Caramelos", Celia Cruz tells the story of _____________ . 5. For her live performances, Celia Cruz usually wore _______________ . 6. Most of the time, when you listen to Celia Cruz, you feel like _______________ . 7. Cuban music is heavily influenced by rhythms and sounds that are ______________ . 8. The credit for discovering the wonderful voice of Celia Cruz should go to ________________ . 9. Another name for this article could be "________________ ."